Whether we as Luxury retail marketers choose to acknowledge it or not, we are in the midst of a revolution in retail and will be soon forced to assimilate or risk relevancy extinction. Although this may, on the surface, seem entirely counter to essence of the Luxury brand as an exclusive entity, Luxury marketers must step outside the perceived “velvet rope,” where status and means dictate who may come to us, and engage our influentials where they live – outside the boutique. This revolution I speak of has been quietly gaining momentum since the advent of smartphone technology. A revolution given impetus by shoppers’ access to previously unprecedented amounts of instantaneous information, social sharing, opinion insights, and real-time engagement on their own terms. Like it or not, we are in the midst of a 180 degree transition in the retail paradigm – from a traditional Business to Consumer (B2C) model to a Consumer to Business (C2B) model. The question is not how to combat this revolution but, rather, how we can use it to our strategic advantage. Luxury retail can choose not to adapt and evolve at its own peril. Enough with the impending doom and gloom. How do Luxury retailers step outside the “velvet rope” and add intrigue and uniqueness to the Luxury shopper experience while maintaining exclusivity and the veil of mystery that fuels shoppers desire to seek out our brand experience? 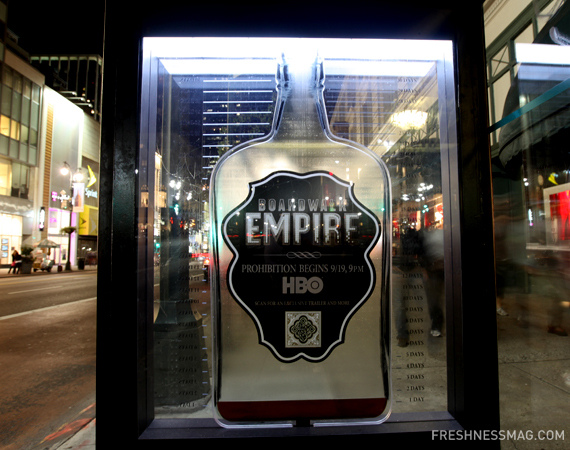 During the weeks leading up to the September 23rd premiere of HBO’s Boardwalk Empire, the cable network and BLT & Associates took a rather standard form of media – bus shelters, and employed QR codes to turn it into a more interactive form of media, with the end goal of generating curiosity and excitement for the show. The billboards were shaped like a large whiskey bottle, and embedded with a QR code which, when read by a cellphone, offered directions and password for users to gain entry to a secret “speakeasy” event, where the first drink was on the house. This campaign initiative perfectly illustrates both what I term the creation of a brand-aligned “mobile moment” as well as the effective execution of “journeying beyond the velvet rope.” The objectives, however, remain how to ensure that this type of message is not only seen by the “right” type of audience (most likely as easily solved by effective placement in desired geographies) and how to deliver an experience that remains aligned with the core values of the brand. Would a Luxury brand’s ultimate engagement objective be to drive consumers of the media to an undercover speakeasy for a cocktail? More than likely not, unless the brand in question is, for example, Moet Hennessey, but the core tenets of such a campaign form the framework for a Luxury retailer’s opportunity to engage in a lifestyle marketing event with the “right” audience to create a unique and exclusive event. Hence, journeying beyond the velvet rope draws the desired audience back inside it. Lifestyle marketing has become increasingly popular as brands work to associate themselves with a way of life customers aspire to. In doing so, brands become purveyors of the tastes, styles, activities, etc. that compliment their identities and product offerings. Much like concept stores, brands who take a lifestyle approach seek to create a perspective or viewpoint, a lens from which the customer can interpret and perceive the collection and how it applies to their own lives. For lifestyle marketing, it’s important for brands to recognize that, while it certainly helps to set a brand identity, associations with external brands or categories should be meaningful. After all, if you are a ready-to-wear brand, customers don’t expect to receive information on upcoming concerts, gallery openings, etc. While these can be value-adds for customers, brands should understand that the majority of customers might not access the brand for this type of content regularly. Rather, customers can be enticed through both the brand and the product, and the stories behind each of these. Having lifestyle content that is a natural extension of the brand not only makes sense, but it makes for an interesting experience. By that accurate definition, the HBO case study analyzed here, although targeted at a slightly different audience, is an excellent example of a media brand journeying beyond their four walls to engage media consumers where they live. Mobile technologies present a uniquely compelling engagement medium to accomplish this objective and, given the very personal nature of the device, coupled with the medium always being within a consumer’s reach, the experience rendered by the brand fits the equation of delivering a Luxury branded experience – luxury + utility + effective “storybuilding” = brand loyalty.